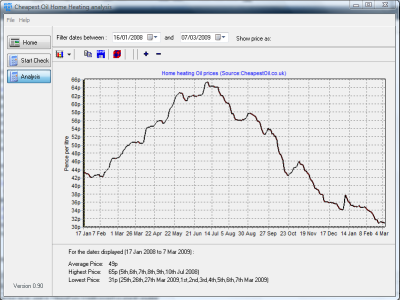 This Windows application can produce charts for the average price of home heating oil based on date criteria you provide it. It may not be useful to everyone however it may aid people who need to research prices. It also includes some of the features in the Energy Report but on your desktop. This is an initial release. This application is completely free for non-commercial use only. Please contact us if you have any queries or wish to request permission to replicate any of the information it provides.